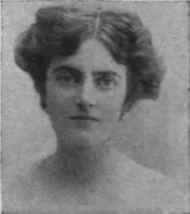 No engagement and marriage of 1908 created so much interest as that of Mr. Winston Churchill to Miss Clementine Hozier, daughter of the late Sir Henry Hozier, K.c.b., and Lady Blanche Hozier, who, by the way, is an aunt of the present Earl of Airlie. Miss Hozier was twenty-three years of age at the time of her marriage; she made her debut before she was nineteen, being regarded as one of the prettiest girls in society and a general favourite. Miss Hozier's family and the Churchills had been friends for many years, although, until the announcement of the betrothal was made, very few friends of the couple were aware that the clever young statesman regarded Miss Hozier with feelings other than those of friendship. It is a curious coincidence that while Mr. Churchill sits in the House as member for Dundee, Cortachy Castle, the seat of the Earls of Airlie, is one of the principal seats in the county in which his constituency is situated, Forfarshire. Mrs. Churchill's uncle, the late Earl of Airlie, who was killed in South Africa, was also a great favourite in Forfarshire, and altogether the " bonnie hoose o' Airlie " has for many years had a great influence on the fortunes of " Bonnie Dundee." Mr. and Mrs. Churchill live in Eccleston Square, and have one child - a daughter.